It is often difficult to feature multiple photos in a layout without compromising the aesthetic appeal of your page. This layout shows how grouping your photos together in a symmetric design can prevent your page feeling overcrowded and how co-ordinating paper designs can be used to complement them. This layout was created using Chatterbox Loft Soft Flowering Vine Paper, Chatterbox Mini Loft Bias Plaid Cardstock, two sheets of brown cardstock, green leaf ink, green ribbon and brown Junkitz alphabet rub-ons. Use your two sheets of tan cardstock as your background. 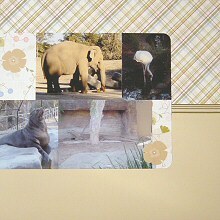 Cut your Chatterbox Mini Loft Bias Plaid Cardstock in half. Adhere one half along the bottom of your left-hand page and the other half along the top of your right-hand page. Adhere your green ribbon across the join on both pages. Select the photo you wish you use for your left-hand page and set it aside. Now focus on your right-hand page. Crop your photos to size. You can use as many photos as you like and cut them to any size you like, but keep in mind that you wish to organise them all into a rectangle. Use pieces of Chatterbox Loft Soft Flowering Vine Paper to fill out your rectangle. When you have decided on your arrangement of photos and pieces of patterned paper, round the top right-hand corner of the piece going in the top right-hand corner. Also round the bottom right-hand corner of the piece going in the bottom right-hand corner. When everything is ready, adhere it all in place. To further embellish this page, you might like to cut out some extra flowers from your Chatterbox Loft Soft Flowering Vine Paper and position around the page. Your right-hand page is now complete. If you wish, you can add journaling along the bottom of this page, perhaps with a brown pen. It is now time to return to the left-hand page. The aim is to extend your rectangle onto this page. Return to the photo you set aside for this page and crop it to size. Round the top left-hand corner. Adhere it to the right side of your page making sure the top is inline with the top of your rectangle on the right-hand page. Fill out your rectangle with a piece of Chatterbox Loft Soft Flowering Vine Paper, remembering to round the bottom left-hand corner. 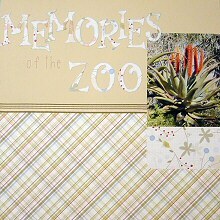 To create your title, use an alphabet template or font downloaded from the internet to transfer the main letters of your title (in my case, 'Memories' and 'Zoo') onto the Chatterbox Loft Soft Flowering Vine Paper and cut them out. Ink the edges with leaf green ink. Once dry, adhere to the left of your photo. Use brown Junkitz alphabet rub-ons to fill in the minor words of your title. By grouping your photos together you have featured five photos, if not more, on your page without making it feel cluttered. The clean lines keep it neat and draws attention to the photos. The co-ordinated backgrounds further enhance your photos by complementing the colours and pulling everything together.